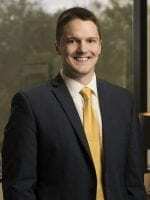 TYLER H. STANTON is an associate attorney in the Tucson office of DeConcini McDonald Yetwin & Lacy, P.C. After receiving a Bachelor of Science in Economics, with an additional major in Political Science, from Washington State University in 2015, he attended the University of Arizona, earning his Juris Doctor degree from the James E. Rogers College of Law in May 2018. While at the University of Arizona, Mr. Stanton was a Federal Taxation Research Fellow, the Executive Treasurer for both the Federalist Society and Student Bar Association, and a member of the Arizona Journal of International and Comparative Law.